How can aluminum theme make your next party decoration stand out? You think aluminum is just a plain, shiny silver metal? Then you have still not seen some of the stunning pieces of aluminum decor. In this year, the new decoration trend, marks it significant splendor with aluminum theme party decoration. Now, the concern is to ensure ‘how to make the party theme stand out’. This calls for some pro tips and ideas to help you plan an amazing aluminum theme party! How to decide on the theme scheme? If you want your party to stand out, it will be to balance aluminum décor pieces with pastel background. Moving on the next part. You can use this for every kind of event; be it a wedding, birthday, exhibition, fashion show, etc. Once you have decided on the metallic theme, you need such astounding ideas to support it. Making the background and base is really important. Use pastel drapes of cream, light peach, mauve or gold. Pair it with tall aluminum vases. It creates a perfect balance in the look and makes a stunning decorative design. Aluminum Nickle embossed vase is great for this. If you want some variation, also try Aluminum Nickle embossed pot vase with it. Not on the dining or sitting table only, but also place small single tables on which you can place Aluminum Nickle bowl/Candelabra. The moldings and detailing on this candle stand will take your breath away. This looks great as wedding decor too! These are the silver parts of the aluminum party theme; you must add a touch of gold to create more hue textures. Adding metallic color variation is the key to creating a better design for party decoration. You can try small golden decorative for handling. It adds glitter and glaze which instantly enhances the overall look of the event. Try using golden balls, artificial flowers with golden ribbons, etc. Also, golden lanterns look really amazing as ceiling hangings. Golden urns are a hit! Yes, they look classy, elegant and also very stylish. For an embellished event decoration, Aluminum Gold trophy urn is a great choice to look at. Place a golden and silver brocade table runner below to escalate the look. These are few ideas that can make the aluminum theme stand out. There are few tips so that you can avoid making mistakes while planning for such great event decorations. 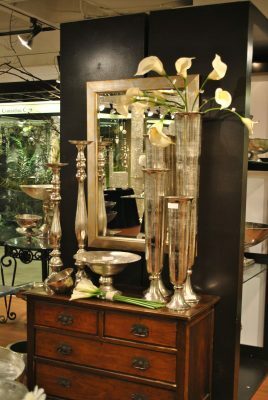 **If you are buying the aluminum adornments; later on, you can also use them for home décor to make your interiors classy! All these will brilliantly help you to make a distinctive look and get you a desirable aluminum theme party decoration. Plan for a stunning metallic theme now!